We know you guys like bargains. 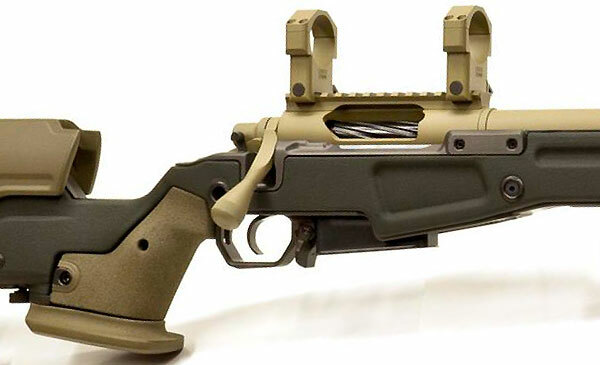 Well here are some very good deals on popular fiberglass stocks from McMillan. Save 20% off the regular retail price. 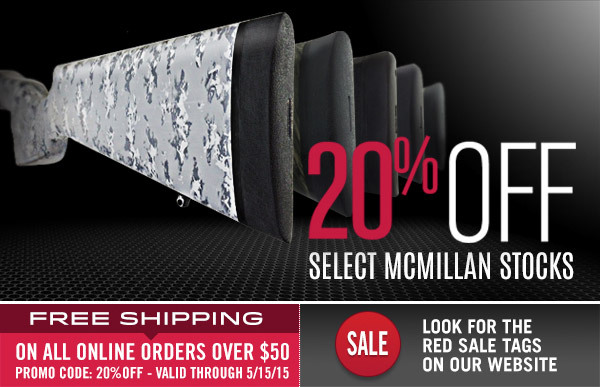 Plus, for a limited time, McMillan is offering FREE shipping on online orders over $50.00. These prices are good through 5/15/2015. Use Discount Code “20%OFF” during check-out. CLICK HERE to see all the deals. Share the post "Hot Deal on McMillan Fiberglass Stocks — 20% OFF"
This handsome Paterson revolver, the earliest known, factory-engraved Colt, sold for remarkable $414,000 at an April 2015 RIA auction. Gun prices climbed into the stratosphere last month during the 2015 April Premiere Firearms Auction conducted by the Rock Island Auction Company (RIA). The most expensive gun at auction was an historic Colt Paterson, the first-ever factory-engraved Colt handgun. Complete with the original fitted factory case with various accessories, this Paterson inspired a bidding war that saw the price rise to a stunning $414,000. That is an amazingly high price for a gun that was not owned by a well-known historic personage. Generally, to command a price in the multiple hundreds of thousands of dollars, a gun must have a significant historic provenance — such as having been owned by a legendary figure such as Billy the Kid or Wyatt Earp. It seems like prices continue to rise every year at auctions of historic and collectible firearms. At RIA’s April Premier Auction, the total sale value of the auctioned guns topped $11.6 million. Remarkably, a first-year production Colt Python (serial #170) sold for $17,250! That makes this Editor regret not having acquired an early model Snake decades ago. Share the post "Historic Colt Paterson Revolver Sells for $414,000"